Amethyst-hued roses and asters are set against a backdrop of soothing green blossoms, and a leaf-lined glass cube vase adds a modern touch. This precious bouquet is a charming gift for friends, family members or business associates, and is just right for home or office. 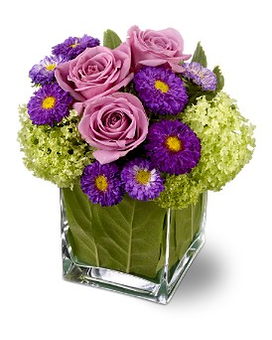 Lavender roses, purple Matsumoto asters and stems of green viburnum are delivered in a clear glass Teleflora cube vase lined with a Ti leaf. Approximately 7" (W) x 7" (H) Orientation: All-Around Standard : TFWEB136 greeting cards & balloons NOTE that all balloons and greeting cards purchased with a flower arrangement will not incur a second delivery charge.